Mark 4:17(AMP); And they have no real root in themselves, and so they endure for a little while; then when trouble or persecution arises on account of the Word, they immediately are offended (become displeased, indignant, resentful) and they stumble and fall away. Every Word of God that you hear seeks to mature you. That is why our theme scripture explains that there are troubles and persecutions that arise on ACCOUNT OF THE WORD: they do not seek to destroy you but merely to test your strength in that very Word. Sadly, some Christians fail in this requirement of maturity when the things that attack them seek to only test how mature they are. How do you respond when you lack? How do you respond when things are not working the way you feel they should? How do you respond when everything seems to be against you yet you are truly a man or woman of God? Maturity is when everything in you is ready to give in to what is not godly and you choose to do the good that the Word requires of you. Spiritual babies fall for anything. However, when you continue to grow, you get to the point where you always choose the path of the Word of God. It is saying ‘I believe’, when the winds of life are contrary to your faith. It is loving when you are hated. It is choosing to forgive when you are ill-treated especially by fellow brethren. It is refusing to observe lying vanities when they seem to speak louder than the truth you know. That is maturity and God finds it honourable! 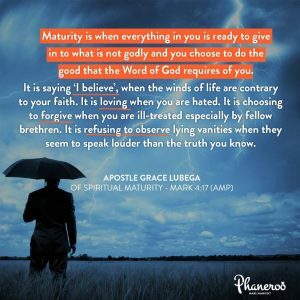 Maturity is when everything in you is ready to give in to what is not godly and you choose to do the good that the Word of God requires of you. It is saying ‘I believe’, when the winds of life are contrary to your faith. It is loving when you are hated. It is choosing to forgive when you are ill-treated especially by fellow brethren. It is refusing to observe lying vanities when they seem to speak louder than the truth you know. PRAYER: My loving God, thank You for Your Word. It grows me every day! I am yielded to it. I refuse to be a leaking vessel. My reflex responses are Word responses. In every place and circumstance, I look to it because it is my strength, shield and buckler. I choose to walk the way of the Word in all that I do. In Jesus’ name. Amen.